A visit to the Summer House Restaurant in Newmarket Racecourse's Premier Enclosure comes as part of a package. An incredibly well-thought out package, expertly wrapped in special touches, and crammed with friendly vibes, welcoming smiles, and effortless efficiency, as it turns out. There's a lot to be said for good old-fashioned hospitality, and this place has it in spades - ticking all the boxes from our arrival, when the relaxed and friendly staff ushered us in, all smiles and jokes for the little one, calling her by her name as if she's the day's VIP, until the moment we left our spacious table and our air con paradise at the end of the day to hit the 28 degree heat outside. 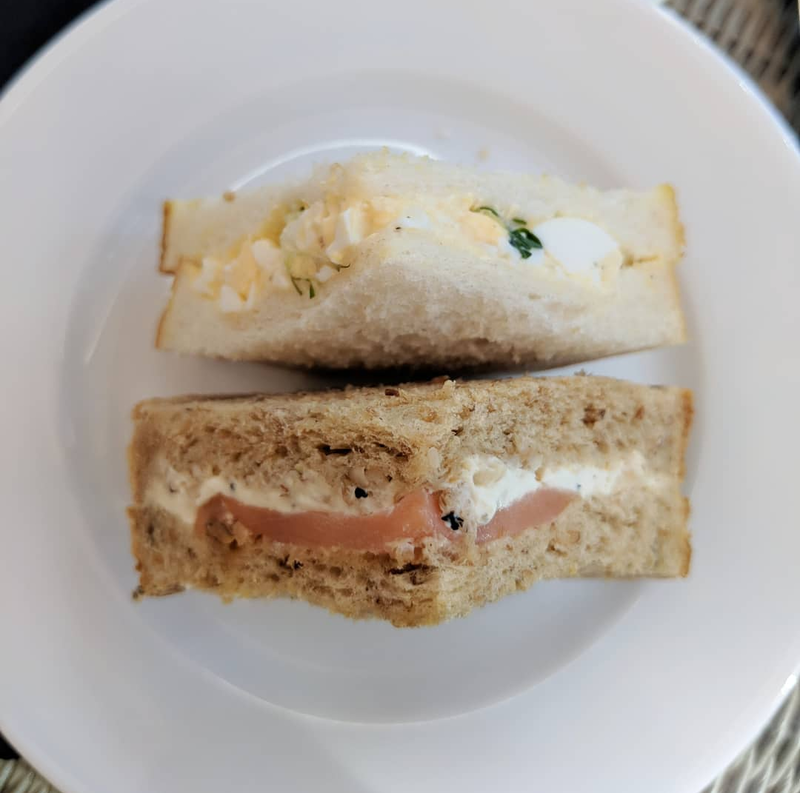 A day in the Summer House Restaurant taught us a thing or two: a bit of structure to a day out is pretty appealing, and a lot of work goes into making everyone feel special. 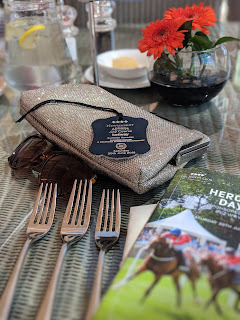 From the start of the day, when we settled in at our table in a sunny corner of the conservatory restaurant and browsed the day's race card and, more importantly, the lunch menu, I was struck by how slick this operation is. 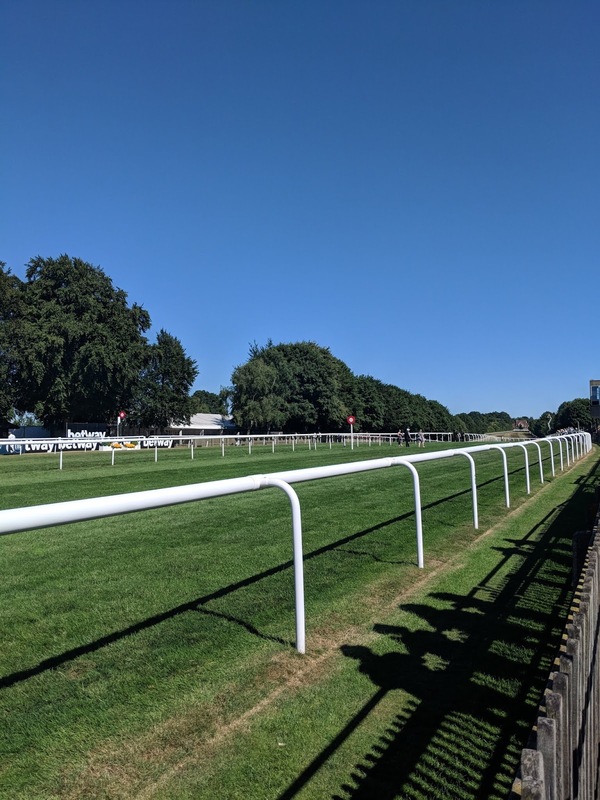 There's a tight schedule of racing to work to, after all. But the service and food don't suffer as a result. Not a jot. 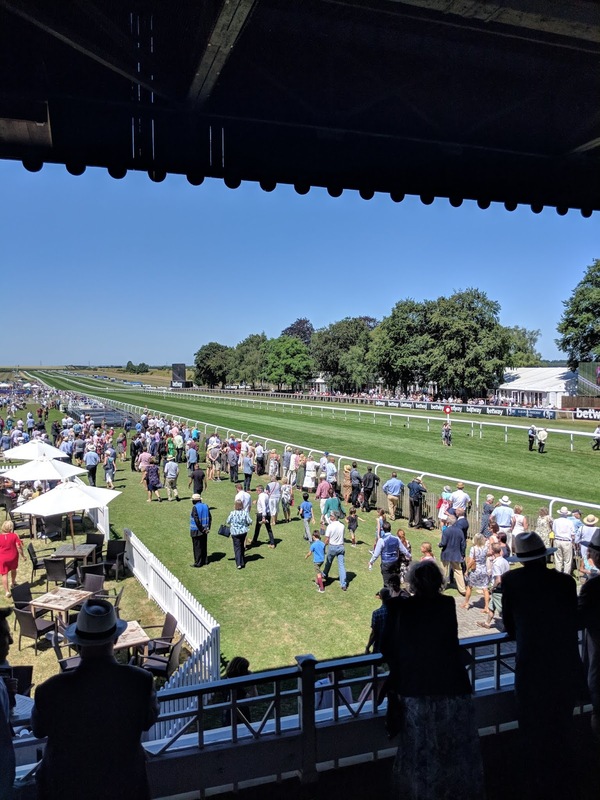 Race cards and screens are prominent features of the restaurant, as are the lovely ladies buzzing between tables to take bets throughout the day, yet the focus on providing fine food and that charming, good old-fashioned hospitality was seriously impressive. I had no problem embracing our full-on dining schedule, and got stuck into a fine three course lunch the moment midday hit. 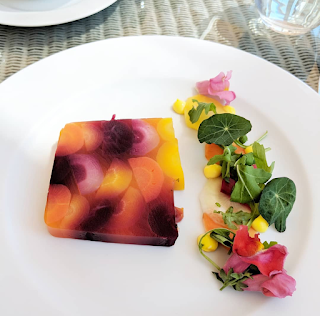 Intrigued by a starter created solely with carrots, the heritage carrot terrine was even more beautiful on the plate than it had been in my imagination. Earthy and sweet notes sung out from the rich rainbow of carrot slices, almost overpowering the saffron mayonnaise and virtually undetectable cardamom. I liked it this way; with the vegetable as the star of the show. 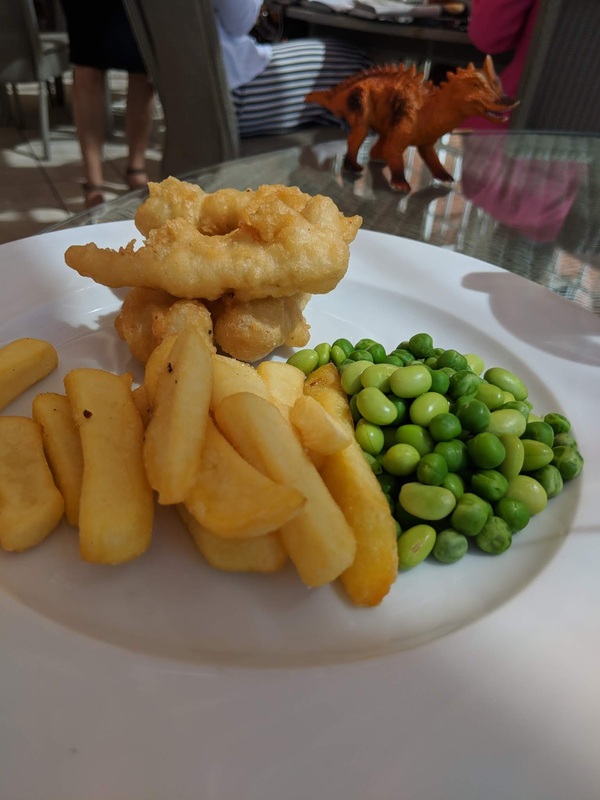 Another irresistible plate of food arrived for my main course. A summery tower of seared sea bass, generously portioned and piled high on asparagus, and a rustic-styled potato cake hiding beneath, soaking up juices from the lemon, caper and parsley butter. 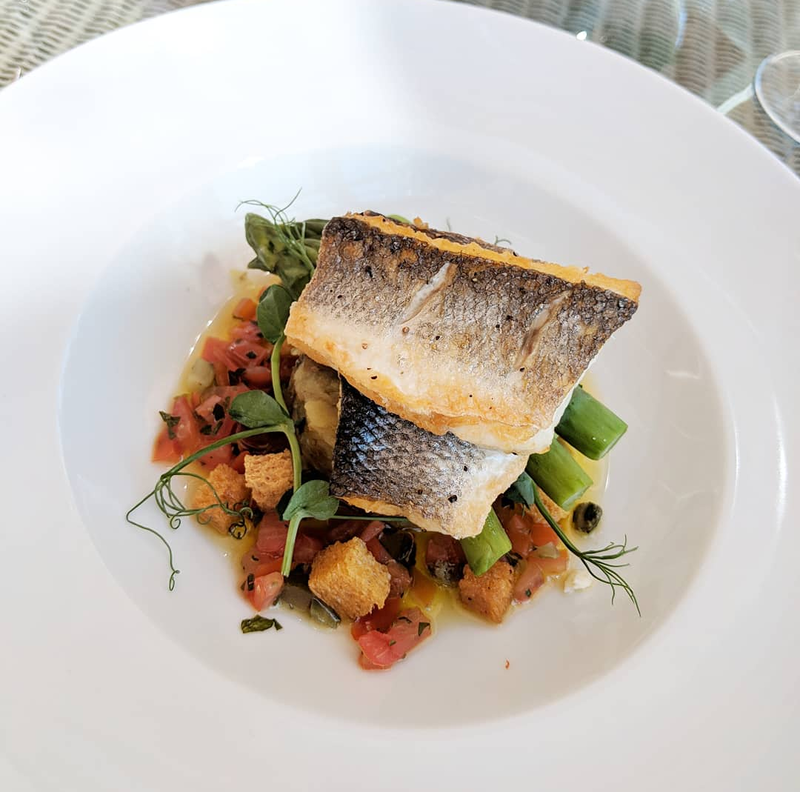 The fish was delightful, well cooked and seasoned, but the highlight was the fresh and bright scattering of tomatoes and croutons mingling with the herby butter. I have never been so tempted to mop up every last scrap of a sauce. 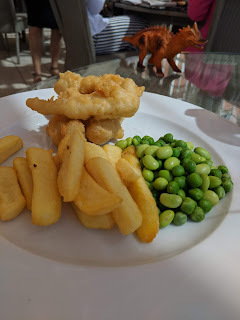 Equally as impressive was the fish from the children's menu: four plump and fluffy cod goujons served with chips and peas, which were followed by a big bowl of ice cream with strawberries and raspberries (just one of the many kind gestures made by the restaurant to accommodate our excitable two year old - the only child visting the restaurant that day, as far as I could tell). When it was time for dessert, yet more pretty plates proved to be a feast for all senses. First up was a pleasing chocolate gateau; neat layers of pistachio, hazelnut sponge, and peanut butter mousse, topped with praline tuile and a moreish slick of shining ganache. 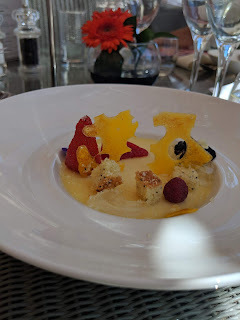 We also dug into a beautifully presented mandarin cheesecake, and a real treat to temper the sweetness of my chocolate fix: a delightfully tart lemon posset dressed with fizz-popping lemon sherbet and delicate bubbles of prosecco jelly. I'm going back specifically for this lemon posset and, next time, there's no way I'm sharing! Before we start plotting our return visit, there's more. A busy afternoon of horse racing is hungry work, after all, and so we ended our day with afternoon tea in the Summer House Restaurant just in time to place our bets and watch the last race. 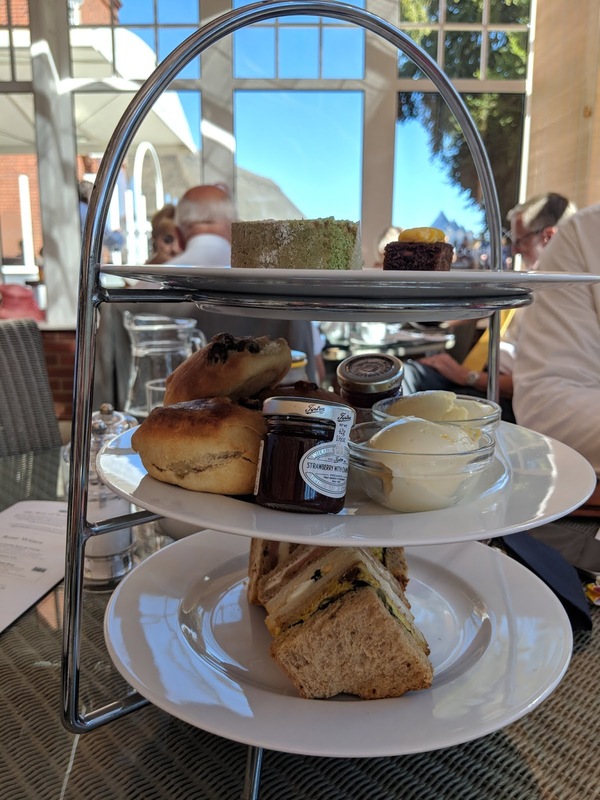 Like clockwork, and with the easy smiles and efficiency we'd become accustomed to, a stand laden with cake, scones and sandwiches arrived. My focus was firmly on the simple and delicious sandwiches: classic egg and cress, smoked salmon with an excellent horseradish cream, and a superb - proper - coronation chicken. Heavenly fresh scones vyed for my attention too; golden-baked on top and soft and sweet inside - once I'd slathered them with cream and Tiptree Strawberry and Champagne jam, the poor cakes didn't get a look in (although our little dining companion was more than happy to take them off my hands). 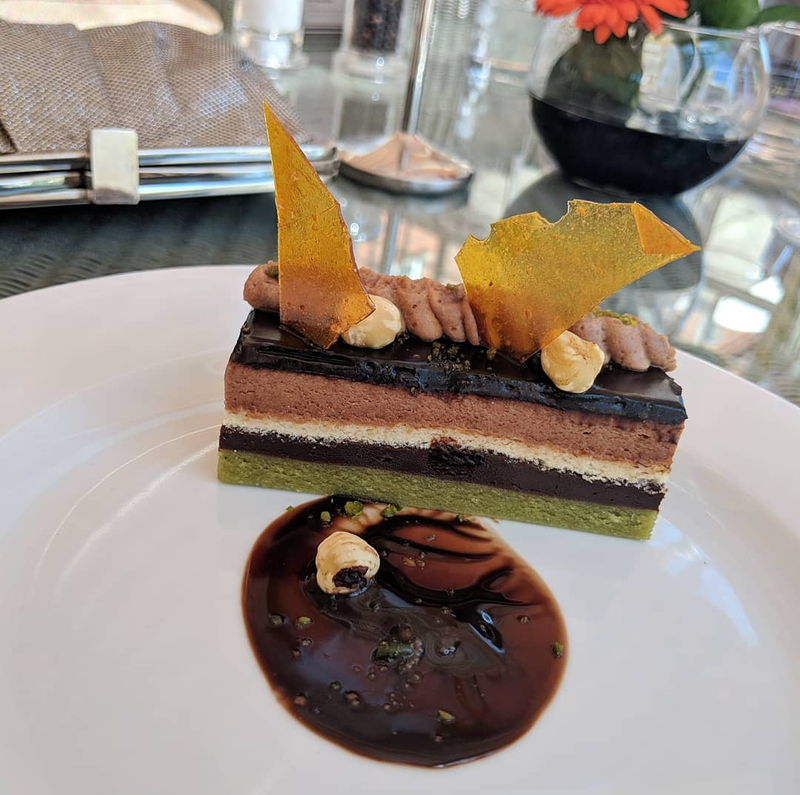 As if we needed one, missing out on those cakes is yet another excuse to plan our next trip to the Summer House Restaurant. Delightful service, excellent food, and a very special place to spend a summer's day; we'll most definitely be back. Hi there thank you for sharing amazing content for us.  I am looking for free food online in united states and found great articles on it. Thanks for sharing awesome content. These are really amazing and valuable websites you have shared with us. Thanks for the informative post. Keep posting like this information.